This plan presents a landscape and architectural design in which the process of erosion is taken as an opportunity rather than a source of frustration. The design aims to incorporate erosion as a useful element of daily life in the Volta Delta Region in Ghana, a coastal area that unfortunately faces serious erosion threats due to human activity and climate change. Can you explain your choice of subject? After finishing three years of the architecture bachelor and one year of the landscape architecture masters it was time for graduation. While reflecting upon those previous school years it became clear that I was missing a more direct urgency. I wanted to be part of a project that could improve the well-being of people that are most in need of improvement. I quickly steered into an interest in designing for a developing country. This would mean getting to know a different culture and designing for a different culture which adds a new aspect to designing which I found, and still find, very interesting. It asked for another approach within my own landscape architecture design process. In order to do this I had to combine multiple disciplines and apply their specific techniques and theories to landscape architecture. This, in turn tested the limits of landscape architecture itself. What can landscape architecture achieve? During my landscape architecture master years, I had an ongoing interest in the never-ending story of erosion and the paradox of the dynamic behavior of nature versus men’s necessity for stability. Areas that are most vulnerable or fragile to this paradox are areas where inhabitants rely on natural resources for their livelihood, which brought me to the coast of Ghana. What or who are your sources of inspiration ? My inspirations came from my visit in Ghana. When I met the Ghanaian students and the people of the Volta Delta, their warmth inspired me. Even though their situation was harsh, they were soft and welcoming. The way the students laid out their hearts discussing Ghana’s issues was touching and how the Volta village kids jumped up and down every time I smiled at them was humbling. Coming back from Ghana, I wanted to keep this spirit alive in my work, a spirit of earnesty, vulnerability and joy. Can you appoint the key moment in your graduation project? My key moment was the discovery of that erosion indeed can be welcomed instead of feared. That it is possible to turn the issue around and use it as a benefit. Why do the people of the Volta Delta on the eastern coast of Ghana have to run from erosion? Why do people in coastal areas across the world have to flee from the dynamics of nature and consequently lose their livelihoods? Erosion shouldn’t be a threat. It should be a benefit to communities; something that can be used to improve well-being and raise the quality of life. It should be welcomed instead of feared. 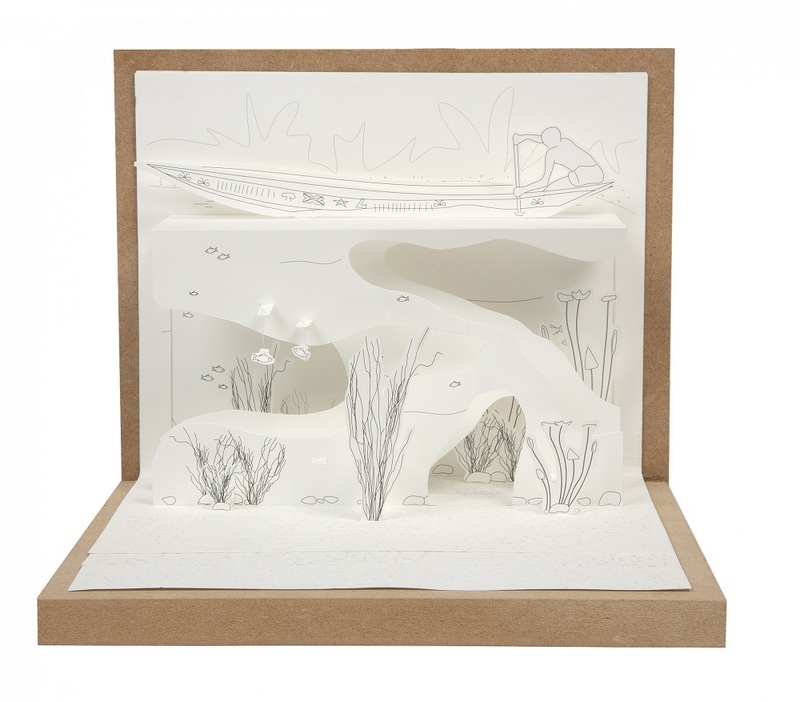 This thesis shows a landscape and architectural design in which the process of erosion accommodates instead of frustrates. 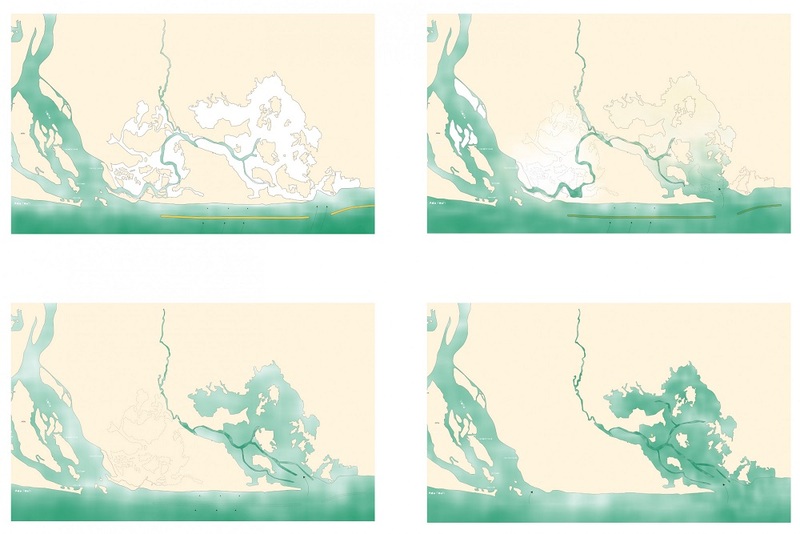 By examining the Volta Delta Region in Ghana – a coastal area which is sadly facing severe erosional threats due to human activities and climate change, the design project aims to incorporate erosion as an integrated and beneficial element of daily life. In the area, the sea is swallowing homes, schools, fish and a big part of the living environment. The inhabitants have tried to move backwards, rebuilding their homes, but even there, the sea swept away their houses. They have seen livelihoods being destroyed in a span of a single lifetime. The people of the West African coast are being stripped from their livelihoods, cultural heritage, and social fabric. Even entire communities are disappearing. This project explores unexpected directions in dealing with natural forces by proposing an inventive and sustainable way of living which is not victim to but profits from the natural threats. 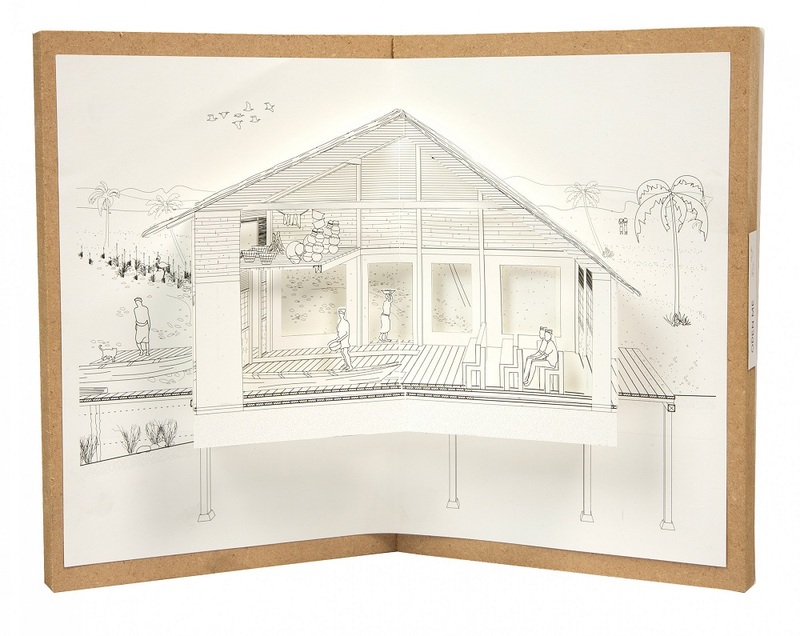 The graduation project also explores new territories. Moving on a spectrum between artistic and scientific ways of doing and thinking, it combines civil engineering with landscape architecture and anthropology. Here, landscape architecture offers a symbiosis between poetic and scientific ways of working and between subjective and objective points of view. 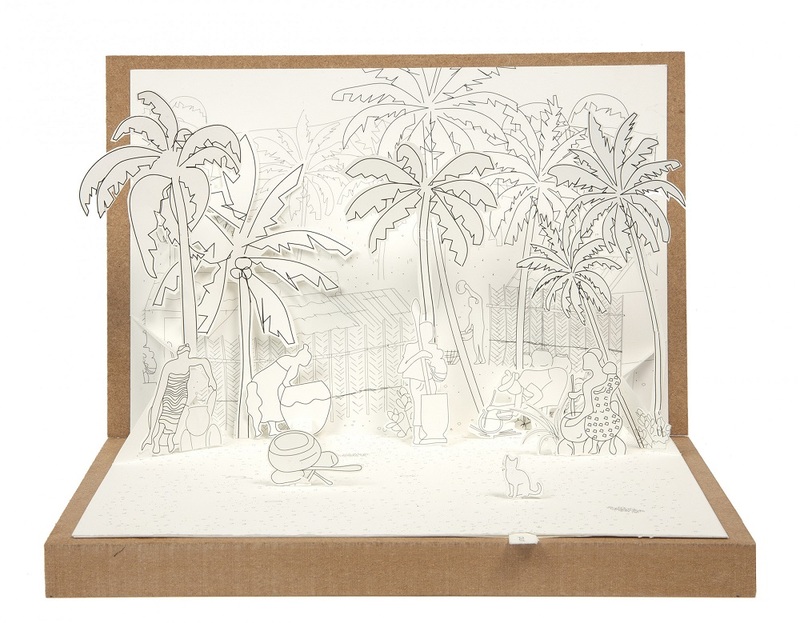 The project also celebrates the joy of visual experimentation, offering narrative sections, animated stories and paper models that pop-up and pop-out. Design is not an ending. It awakes and awaits an imprint. Design here is conceptualized, not as an imposing and totalizing project, but rather as a discipline which supports, affords and activates. It shows how design can be flexible and affording and how landscape architecture can strengthen resilience and adaptivity. This thesis project gave me a lot of energy. Working through the scales – moving from the bigger landscape scale to the very small scale of patterns on a dress – I realized I still wanted to learn more about the smaller scale. Therefore, I decided to keep on studying and do a second master at the TU Delft within the Architecture track. I chose to do the ‘interiors’ studio for the first semester of the year. I will start my second graduation in September in which I aim to design something completely different from my previous graduation, without losing my landscape architecture approach in interpreting and designing space. I hope to inspire designers to pay attention to circumstances in order not to impose or obliterate. I hope to show that there is value in a more humble or modest attitude towards design. I believe that as architects we have the power to accommodate for a big part of people’s well-being and therefore hold a responsibility to be empathic towards others and their lives. To achieve this, I hope to encourage a landscape architectural approach in design. I believe landscape architecture can tell a story, think in terms of time, processes, flows, networks and systems, and at the same time bridge the artistic with the scientific.